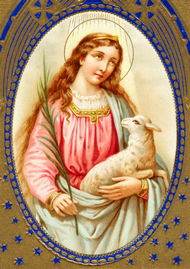 Saint Agnes was twelve years old when she was led to the altar of Minerva at Rome and commanded to obey the persecuting laws of Diocletian by offering incense. In the midst of the idolatrous rites she raised her hands to Christ, her Spouse, and made the sign of the life-giving cross. She did not shrink when she was bound hand and foot, though the manacles slipped from her young hands, and the heathens who stood around were moved to tears. Bonds were not needed for her; she hastened gladly to the place of her torture. When the judge saw that pain had no terrors for her, he inflicted a sentence comporting an insult worse than death: she was condemned to be taken to a house of infamy and her clothes stripped off. I have an Angel with me, she said, and he will guard me. Christ, whom you do not know, surrounds me like a wall which cannot be forced. And so it occurred. The Spouse of Virgins revealed, by a miracle, His custody of the pure in heart: her hair grew miraculously to such a length that she was entirely covered by it. The place to which she was taken was illuminated by a brilliant, inexplicable light; and there she knelt down to pray. At that site a Church has been built in honor of this young maiden's victory over impurity. Only an impudent suitor, the cause of her arraignment as a Christian, dared approach her, and her Angel struck him dead at her feet. His father prayed Agnes to raise him up again by her magic arts; she answered that magic was not responsible for his death, but only the young pagan's lack of respect for God. She said she would pray to Him that her Lord's glory might be manifested by the miracle his father requested, and it was granted to her prayer. At length the sentence of death by the sword was passed upon her by a subordinate judge. For a moment she stood erect in prayer, then bowed her neck to the sword, rejoicing that the time of her liberation had arrived. The Angels bore her pure soul to Paradise. A week after her death, Saint Agnes appeared to her parents as they were praying at her tomb; she was amid a choir of virgins clothed in golden robes and crowned with garlands. She begged them not to weep for her as for one dead, telling them rather to rejoice with her in her happiness. Reflection. Her innocence endeared Saint Agnes to Christ, as it has endeared her to His Church ever since. Even as penitents we may imitate her innocence in our own sphere. Let us strictly guard our eyes, and Christ, when He sees that we desire to keep our hearts pure for love of Him, will fortify our resolution and bless it. Blessed are the peacemakers, for they shall be called children of God.